Free tuner apps from big manufacturers are so in right now. Boss released its Tuner app back in June, and Fender has followed suit with the similarly imaginatively named Tune. Developed by new subsidiary, Fender Digital, Fender Tune is available for iOS only (sorry Android guitar fans), and promises an intuitive, easy-to-use interface that makes it easy for newcomers to get their instrument in tune, while also covering basic tone tips, including strumming and setting up amps. The app detects notes from acoustic guitars and amplified electrics, and offers auto tune, chromatic and manual tune modes, including alternate tuning options and the ability to create custom tunings. Fender promises its DSP technology delivers spot-on accuracy, as well as offering nifty adaptive feedback bubbles. Tune is available now for absolutely nothing from the App Store. 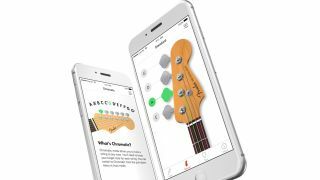 What's more exciting, however, is what Fender Digital has in store - apparently, Tune is the first in "an entire ecosystem" of apps designed to improve playing and connect guitarists to other players.